I've been on this forum long enough I don't think this is in bad form. I almost met my maker today. 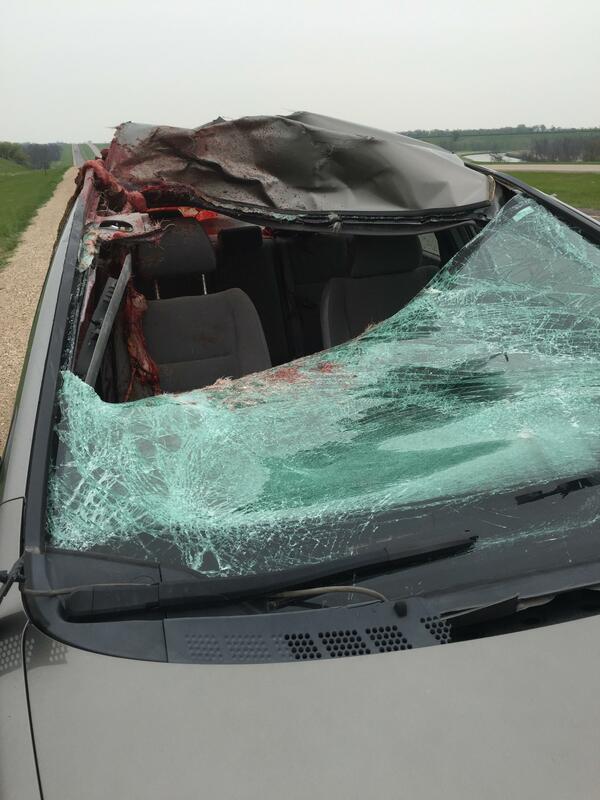 Hit a buck mule dear going 70 head on and never saw it and no breaks were applied before impact and according to the Highway patrols assessment of the vehicle and damage "this is the worst animal collision I've seen in 15 years that didn't involve a fatality". A Ruler's away in distance I would have taken this deer in the face. Dislocated shoulder and shock and I'm alive and thankfully my oldest son I made stay home and not come with me (he was going to come and make the hardware store run). Someone was looking out for me today. The deer came through the front windshield ripped the roof of the car half off and exited the back windshield and there were antlers that went through the back seat and ended up in the trunk. I was covered in guts, blood, and hair, and had an unexpected hospital visit but am home now and I will shave tomorrow, left handed ....... Hug those close to you my friends.... Life can change in an instant. Glad to hear you weren't hurt badly. It looks like it could have been much worse. Get well soon and thanks for sharing. I'm glad you are ok buddy! That looks pretty rough. Oh, thank goodness your son and you are okay. I wish for both of you a very quick mending. The fact that you can even post this is special, indeed. Plese, stay well. Holy crap man! That deer pretty much exploded on impact! Thank God your son stayed home and all you suffered was a dislocated shoulder. Get well soon! Yeah, I don't know if I'd want to try shaving lefty. Or on the other hand, it might be kind of fun. Let us know how it goes! Whoa... Glad you are okay! I remember I went on a trip to deer country some time ago and was (stupidly perhaps) shocked when the locals told me how deer account for a sizable portion of motor vehicle fatalities. This gruesome scene proves their point. Wow that is a nasty aftermath. 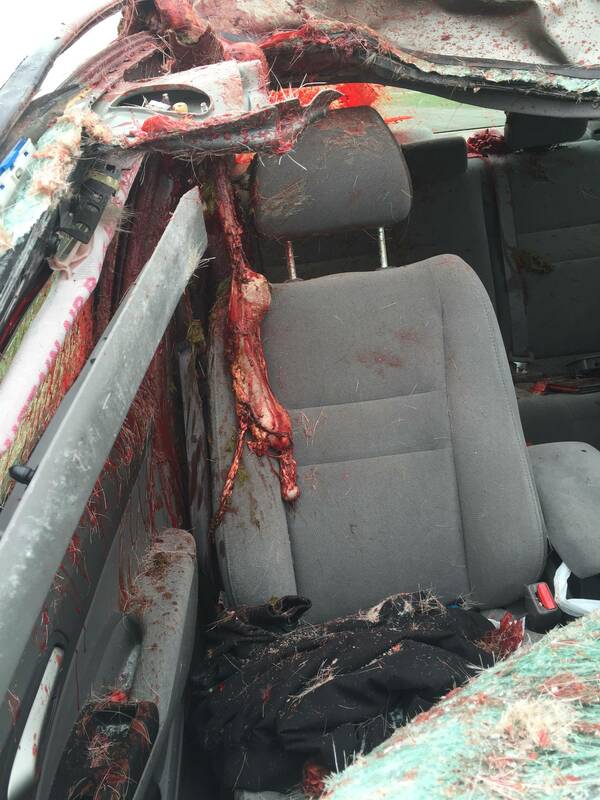 Glad to hear that your ok. That deer really should've looked both ways. On a hunting trip once in my late teens I landed a deer on opening day. My dad's friend Fritz did too. It was decided that since I was still in high school, I should ride home that night with Fritz and dad would try his luck two more days. So dad got skunked and called Wednesday to tell mom he was heading home after closing up camp and that we shouldn't wait up for him. That night I heard the distinct rhythmic beeping of a heavy truck in reverse. I looked out my bedroom window and could see a flatbed tow truck with what looked like a hunk of junk the same color as dad's F150. It was backing into our driveway. I got out of bed and went out with the rest of the house. Just in time to see dad get out of the passenger side of the tow truck's cab. It had snowed a lot that season and especially so close to home. Well, dad made it almost all of the way home to a bridge about 30 miles away marking the last leg of the trip. He made the left turn onto the bridge like he had hundreds of times before. This time though there was black ice. The truck slid past the bridge and off the road. Rolled down the embankment and rested a few feet from the river below. Dad was fine. The F150 was not. The most disturbing part was the passenger seat. Where I would have been sitting had I not rode home a few nights before with Fritz. While the truck was rolling down the embankment it took an especially hard hop that crushed the cab only on the passenger side. Some of the gear and food was in the cab of the truck and must have been airborne during the tumble. The roof of the cab crushed in and one part was wedged into the headrest of the passenger seat about 8 inches and strangely enough had crushed and pinned a loaf of bread. Like it was coming through the front and back of the seat in some weird Philadelphia Experiment sort of way. That's where my head would have been. If I hadn't rode home with Fritz instead. You're fortunate to have your life. So glad to hear you're alive and your son wasn't along for that ride. Hitting a deer, an elk, or similar is no joke. I could tell stories all night, but the point is that at that speed plus an animal of that kind of mass, living to talk about it is luck beyond luck. I've seen a few deer on vehicle accidents in person, know a lot of people who have had their own encounters personally, and I'm amazed by your pictures. I would never have thought after seeing and hearing stories about similar incidents, that a mule-deer would explode like that. I've seen a deer get hit by a car doing 40, roll over the hood, crush the windshield, roll over the roof, flop onto the pavement, and get up and stumble a bit before dropping, presumably succumbing to the injuries. The guts and fur there is telling. The energy in that kind of collision is immense. I know it's exponential to an extent. 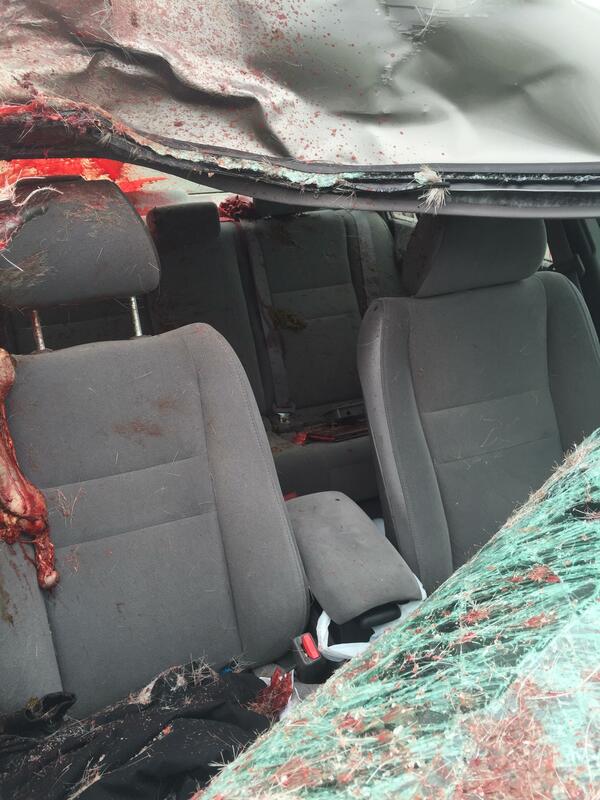 I've just never seen the aftermath of a 70 mph deer on vehicle encounter and it's pretty horrific. Question, did you get to keep the meat? I mean it's not like you'd have to have it butchered after that. Looks like a lot of it would be ready to be froze as hamburger.